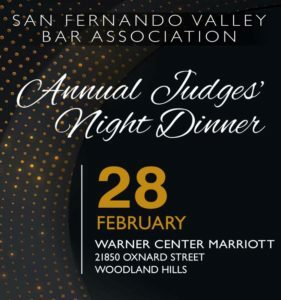 On Thursday, February 28, 2019, the SFVBA will honor Los Angeles Superior Court Judge, David B. Gelfound, and Judge Shirley K. Watkins at its annual Judges’ Night Dinner at the Woodland Hills Marriott Hotel. Judge Gelfound will be honored with the Bar’s prestigious Judge of the Year Award, while Judge Watkins will be presented with the Bar’s Administration of Justice Award. Judge Kevin C. Brazile and Judge Eric C. Taylor will also be honored with Special Recognition from the SFVBA’s Inclusion and Diversity Committee for their successful, ongoing efforts to diversify and engage the bench, and their unwavering support of the 93-year-old Bar and its goals.